The main house recently built with all modern amenities. 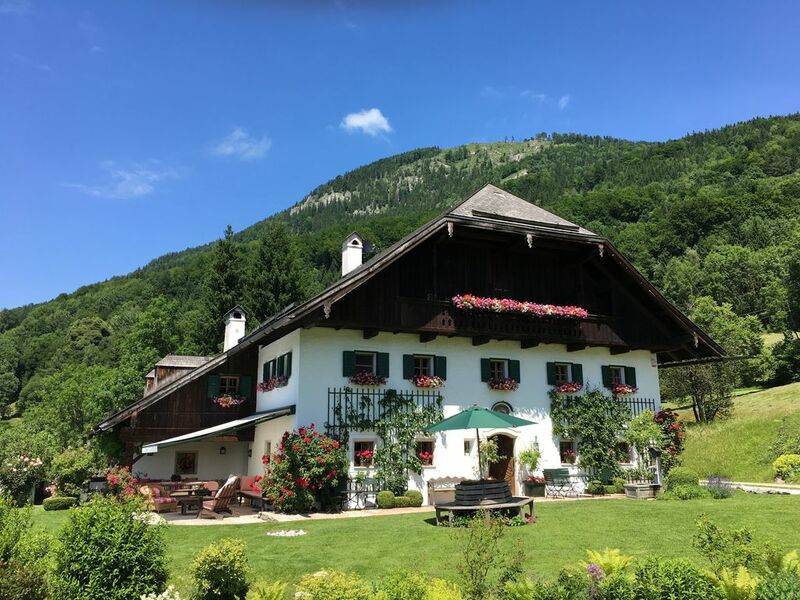 Surrounded by 70 acre of meadows and woods with view to the alps and over the old town of Salzburg. Great excursions in the surrounding. A large living room, library, large playroom equipped with billiard, a dining room for max. 20 persons, modern bathrooms ensuite, a heated outdoor pool. Great opportunities for excursions to the mountains as well as to the lakes surrounding Salzburg. Retired business man, we have 4 children and 7 grandchildren. Ideal für Familientreffen mit Kindern, für Ausflüge in die Berge oder zu den Seen- Ebenso für Festspielbesucher oder Firmen die auch Gäste empfangen und repräsentieren wollen- Ideal for family gatherings, for excursions in the mountains or to the lakes. Also very suitable for business meetings in a secluded atmosphere. Prachtvolle, sonnige Lage mit unverbautem Blick auf Salzburg, nur 12 Minuten zur Sadtmitte. Located on the sunny hills overlooking the old town of Salzburg which is 12 minutes away by car. fixe line available, extra charges per use. Modern kitchen with small breakfast table. Microwave, dishwasher, electric stove. We were looking for a nice-sized place to take the extended family for a ten day summer trip. The location of the house is perfect. 12 minutes from the center of Salzburg up the Gaisberg (the lush green hill to the east of Salzburg). The view is a picture-perfect postcard look down at Salzburg and the Untersberg mountain beyond, and endless snow-capped alpine peaks into the distance to your left. The house has several good bedrooms, and a couch in the billiard room that our nephew slept on. And wifi, good bathrooms, everything you need. There is a crystal clear pool and great pool patio area where you can relax, have a glass of wine, and watch the sun set over Salzburg. We spent almost every evening here. The house is fully up-to-date and yet it feels like an old fashioned alpine lodge. While we were there the housekeeper Sylvana and her daughter kept everything absolutely perfect, and they are among the nicest people you will ever meet. - A close-by city with lots of history, walking tours, shopping, dining -- which Salzburg has in abundance. - And... an amazing house to go home to in the afternoon, when we're sick of all these things. Just off the property are lots of trails through the forest of the Gaisberg that you can spend hours strolling through. For a family vacation in Salzburg, you could not do better. Absolutely loved it and will go back again. Gut geeignet für Familien, für ungestörte Konferenzen.